My name is Maria J. Matsushima. I am a spouse of the priest of Nagoya parish in Japan and a choir director. I was baptised in Yokohama sixteen years ago and soon joined the choir. Orthodox singing seemed both something familiar and something new. No doubt it was a kind of music, but more than that. Why? As time went on, there came to me a lot of questions on both practical and spiritual matters. "In which ways is Orthodox singing different from the Western sacred songs? ", "How to manage songs without written music? ", "What is the eight tone system? ", "What is the function of Church singing? ", "What is the tradition I have to keep and hand down? ", and so on. I wanted to know. But how? In Japanese, books and materials on Orthodox music were very scarce. Sometimes I found the articles on it, but most of them made me dissapointed, since they were distorted to some extent by the influence of Western music. I ordered a lot of books and scores from US and UK, anything related to church singing. The books by Gardner and Fr. Schmemann were a great surprise for me, opening the door to the new vision. Besides books, I met many people concerned with liturgy, such as priests, choir directors, seminary students, readers, both inside and outside of Japan. They kindly answered my questions and gave me advices and support. Looking back on those years, I can see that God sent me necessary things and proper teachers according to the time and my condition. Too many to enumerate here, I would like to express my gratitude to all these people. I opened the Japanese version of this website page in order to offer materials and some of translations which had helped my understanding, for those who need basic knowledge and want to know the deeper aspect of our church singing in liturgy for their reference. Even now, the available books in Japanese are few. In addtion to the above, this spring I opened this English page introducing our church singing in Japan. I would like to say to the world that "a member of Christ's Body is singing the same songs here in Japan." At first, I introduce my papers about the History of the Japanese Church Singing, which was originally published in the Seikyo Jiho (the official Magazine of the Orthodox Church in Japan) last year, although I still continue further research. It is my great honor to show you Our church in Nagoya and Handa, too. A brief introduction of St. Nikolai's effort to establish church singing in Japan and the characteristics of the Japanese Church Singing from a historical point of view. Pokrovsky was a church musician who interpreted Russian masterpieces into Japanese. This is an introduction of his life and pecularity of his composition. Would you listen to some of our singing? Let's jump.NEW! I am a member of the Holy Annunciation Church in Nagoya but I go to the St.John of Damascus Church once every month with my husband, Fr.George who is in charge of both of these churches. I would like to introduce you to them with pictures. This small booklet has been ofgreat help for non Japanese attendants, helping them participate more fully. 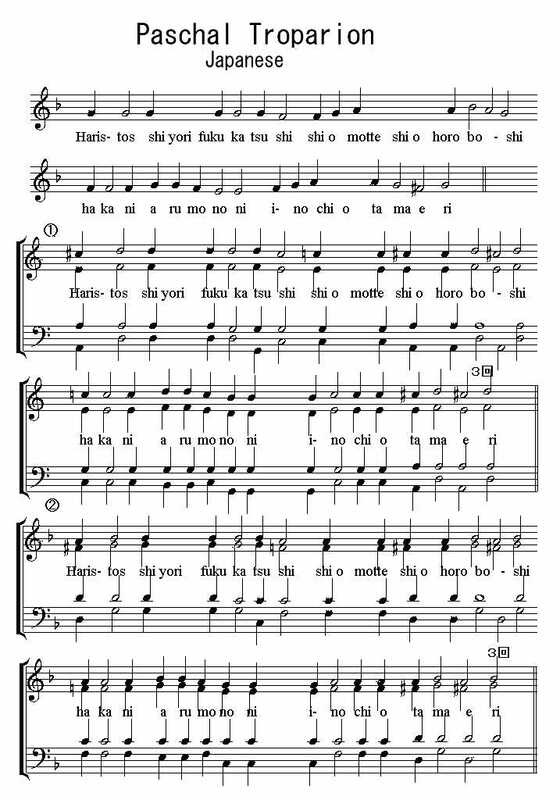 On Sundays, members from abroad sing "Shu awareme yo. (Lord have mercy)" and other songs together with Japanese. As Romanian members increasing, we prepared a leaflet with principal prayers, Creed, Lord prayer, Communion prayer and the responses for Litany. Thanks to Stavropoleos Choir, this is the first release of Japanese Byzantine chant. Stavropoleos is a famouse Byzantine chant choir in Romania. They came to Nagoya for World Expo '05 in Aichi and celebrated Liturgy together for one month.